Wonderful insight and Hrishi is just a joy to listen to! great show for those that love "The West Wing"
We’re joined by Mayor Pete Buttigieg, 2020 Presidential hopeful, for our discussion of “Opposition Research,” in which Matt Santos travels to New Hampshire to introduce himself to the electorate. Bradley Whitford joins us this week to discuss "Faith Based Initiative," which he wrote! Incredibly, his first time writing for television was this episode of The West Wing. He tells us how it all came together, as we pick it apart. We’re joined by Paul Redford, who wrote for West Wing Seasons 1–5, as well as Sports Night and The Newsroom. He’s responsible for some classic West Wing storylines, and we’re long overdue for a chat with him, so we’re making up for lost time with this bonus episode. Mary McCormack joins Josh and Hrishi to discuss "A Change Is Gonna Come," recorded live in San Francisco. Plus, Roman Mars, host of 99% Invisible and noted flag expert, drops some vexillological knowledge. Special thanks to Professor Rebecca Nedostup for shedding light on Taiwan and China. In this special bonus episode, we learn about what it’s like casting The West Wing. Our guest is Tony Sepulveda, who was the casting director for Seasons 3 and 4. Wait a second: Is Annabeth Mandy 2.0? Plus Donna pushes Josh away, CJ pushes Toby away, and Santos pulls Josh in with his wily political moves. We need a bipartisan summit with Red Vines families and Twizzler families so we can discuss all of this and more. Big changes are getting announced: CJ is the new Chief of Staff. More importantly, Josh and Hrishi announce "Melon Day" as an official West Wing holiday. Grab a muskmelon and a plate of brownies, and hit play! Plus, former ambassador Jacob Walles tells us about the years he dedicated to brokering Mideast peace, including his time at 2000 Camp David Summit, and he tells us what this episode got right about those conversations. It took a lot of diplomacy behind the scenes, but Josh and Hrishi have agreed to come together to negotiate our feelings on Season 6, Episode 1. Pull up a chair and join us for the discussion at Camp Josiah. We literally cannot wait for you to hear how much The West Wing influenced Parks and Recreation. We spoke to the co-creator of the show, Michael Schur, and two of the stars, Rob Lowe and Adam Scott, to learn about the parallels between the Bartlet White House and the Pawnee Parks Department. Stop pooping! Just listen. Cried, "What do we do? We're all stuck here in a cell!" "Let's go!" he started to yell. And said, "Other people are hell." They tried to get us to renounce The West Wing, but Eppur Si Puodcaste! Josh and Hrishi investigate some of the real world mechanics behind NIH grants and the federal judiciary with help from cancer researcher Dr Muller Fabbri and political journalist Jason Zengerle. Full disclosure: you’re going to hear the words 'full disclosure' a lot in this episode, as we discuss "Full Disclosure." Lawrence O’Donnell joins us to discuss how he wrote this episode, how Richard Schiff changed its meaning without changing a word, and how Josh Lyman’s plot line landed him in Hillary Clinton’s crosshairs. A potential nuclear threat looms on the horizon, so let’s head down to the Situation Room to discuss The Warfare of Genghis Khan. We’re joined by former congressman and nonproliferation advocate John Tierney, who catches us up on nuclear politics then and now. And Josh and Hrishi manage to listen to the arguments of NASA analyst Jacob Keaton without him even having to take them stargazing or anything. Sleep in! We'll wake up the President for you to tell him about our great idea to record a podcast about the Slow News Day episode of the West Wing. Joining us in this historic endeavor is returning guest Eli Attie, who shares his memories about real and fictional West Wing attempts to build a legacy. Nancy Altman, president of Social Security Works, also drops by to tell us just how Toby's efforts compare to the real history of Social Security reform. PS: we had a data glitch while recording and lost Josh's mic audio, so his side of the conversation is not up to our usual standards. Sorry about that! This week, we discuss "The Benign Prerogative," and the not so benign aspects of Presidential pardons. We're joined once again by Janel Moloney to talk about Donna's moving storyline in this episode. Plus, Lin-Manuel Miranda makes a little cameo (#Hameo) to help us with the original text by Alexander Hamilton from which this episode takes its name. Shut! It! Down! Josh and Hrishi are walking right up to the hallway outside your office to talk about “Shutdown.” Gene Sperling, former White House Director of the National Economic Council, joins them to compare Bill Clinton's shutdown game plan to Jed Bartlet's apparent lack of one. We're joined this week by Alexa Junge and returning guest Lauren Schmidt Hissrich. They co-wrote "Disaster Relief," and together, we try to propulgate the backstory of this episode onto the frontstory. Like President Bartlet in Oklahoma, you'll never want to go back to work! What is a “Constituency of One”? You know, it’s all about that boss, ‘bout that boss, those troubles. It’s all about that boss, ‘bout that boss, those troubles. Toby and POTUS. Will and Bob Russell. Amy and the First Lady. Plus, we speak with Communications Director Jennifer Palmieri, whose list of bosses includes Secretary Hillary Clinton and President Barack Obama. 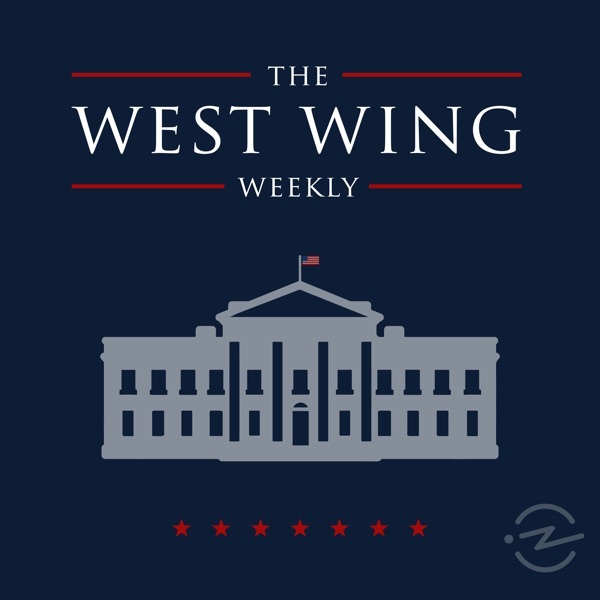 Listener beware - like the episode we're discussing, Han, this installment of The West Wing Weekly has more sad piano music than all previous episodes combined. When they're not lost in a sadness so deep no tears will come, Josh and Hrishi interview Paula Yoo, the writer who came up with the story of a would-be North Korean defector who visits the White House. Josh and Hrishi take a deep breath and dive headfirst into the post-Sorkin years. They're joined by guests Bradley Whitford and Ronald Klain to discuss the suspense of the Season 5 premiere — a fateful moment for the characters, and the show itself. Recorded live at Georgetown University. We’ve reached the end of the fourth season, and the end of Aaron Sorkin’s tenure on The West Wing. For this special farewell, Aaron himself joined us on stage at the historic Town Hall in New York to teach us how to say goodbye. He surprised us with his candor, and we surprised Aaron and the audience with special guest Emily Procter, as well as heartfelt messages sent in by the cast and crew. Live from the Lincoln Theatre in Washington, DC, Josh and Hrishi discuss the penultimate episode of Season 4—and all its trip-hop-laced anomalies—with special guests Bradley Whitford, Ronald Klain, and Melissa Fitzgerald. Plus: a surprise guest who’s surprised to be part of the podcast. We’re live in London! Josh and Hrishi discuss Life on Mars with guests Richard Schiff (@Richard_Schiff) and Eli Attie (@EliAttie). Plus some special West Wing-themed musical performances from Debbie Fiderer’s favorite a capella group, The Swingles (@swinglesingers). Manage to land two major Broadway talents? Well, the word got around that they’re like, "Sorkin is insane, man"
Let's talk about the napkin in the frame." Please set your cell phones to airplane mode, it’s Angel Maintenance time. In this episode we’re joined by former Acting Secretary of the Air Force (and former Secretary of the Army) Eric Fanning for lots of juicy details about Air Force One, including the fact that there’s more than one Air Force One. And Josh looks back fondly on filming this episode, for reasons involving Vaseline. Privateers has a special place in our hearts because we love the scene where Allison Janney can’t stop laughing - and she’s here with us to talk about the fugue state necessary to create such memorable giggles. We’re also joined by Josh’s Scandal costar Jeff Perry, and Helen Slayton-Hughes, who played Marion Cotesworth-Haye of Marblehead. And we get the final word on the privateer question from Bren Landon of the DAR. The Laurens make good! West Wing writer Lauren Schmidt Hissrich joins us to recap Red Haven's on Fire and share stories of the real world Lauren confusion behind this episode. And Senator Tammy Duckworth tells us what to expect when you're a senator who's expecting. Ah, Miss Hamantaschen! It's the California 47th. Josh and Hrishi discuss the linguistic nuance of Rice Krispies and what one calls the treats made from them. And, Mrs Hottentot, Hrishi introduces a handy online tool for President Bartlet: the Debbie Fiderer nickname generator. A live Big Block of Cheese Day from San Francisco Sketch Fest! Hrishi and Josh are joined by Dulé Hill to answer questions from fans - including a semi-surprise guest. Nate DiMeo of The Memory Palace (@thememorypalace) podcast tells the history of the big block of cheese, and Helen Zaltzman of The Allusionist (@AllusionistShow) gets VERY salty with her language as she explains the origin of the word “sh**hole.” Saltiest of all, though, is the 50 pound wheel of Pecorino Romano that we actually had delivered to the Marines’ Memorial Theater to feed our hungry questioners. For our discussion of Inauguration: Over There, Josh regales Hrishi with tales of shooting in his underwear and throwing snowballs at Janel Moloney. Plus, we’re joined by West Wing writer and former Director of the National Economic Council Gene Sperling (@genebsperling). He tells us how the Clinton administration's regrets over the handling of the Rwandan genocide led to the Bartlet administration's doctrine for the use of force. Inauguration: Part I is the first part of our two-part series about a two-part series of West Wing episodes. Josh and Hrishi dig up fun facts about presidential bibles, and cast a critical eye on CJ's flirting and Josh's mean sass about Jack Reese. They also talk with Danica McKellar (@danicamckellar) about how a character named Tracy became Elsie Snuffin. As the West Wing takes a trip to Dayton, OH, for The Long Goodbye, Josh and Hrishi talk to playwright Jon Robin Baitz, who playwrought the episode. He talks about how his own father's illness informed the script in ways he didn't realize at the time, and gets props from our hosts for finally letting C.J. get some. For our discussion of Guns Not Butter, Josh and Hrishi go on a hunt for Hrishi’s Hebrew name that is almost as intense as Donna’s quest to get Josh’s phone into the hands of Senator Hardin. Tom Hart of ONE (@OneCampaign) makes the case for foreign aid, and MAZON’s CEO & President Abby Leibman (@MAZONusa) backs Charlie up on the subject of food stamps on the military, but not one single person sides with poor Josh Lyman on the remote prayer issue. On the West Wing, it’s Toby’s birthday (December 23), and his father visits. On the West Wing Weekly, it’s Josh’s birthday (January 17), and HIS father visits. We turn to Mr Robert Malina for some Yiddish info and some Joshish insights. Plus, we’re joined by a couple of the Yale Whiffenpoofs who appeared in "Holy Night" to tell us about how they ended up singing for President Bartlet. One of us! One of us! Will Bailey finally arrives in the West Wing and we've got a trio of guests to welcome him. Former Cabinet Secretary Chris Lu (@ChrisLu44) talks about the (nonexistent) precedent for cabinet resignations; director John David Coles breaks down his unusual camera choices; and Richard Schiff (@Richard_Schiff) reveals what song Toby had stuck in his head the first time he met Will. Eli Attie (@EliAttie) and Kevin Falls (@KevinFalls) are our guests to talk about the “break glass in case of emergency” writing that went into “Swiss Diplomacy”, a rare episode without a Sorkin writing credit. These guys have stories! And they’ll tell you why, when in doubt, you should always run for president. Stock up on Cheetos, because Joanna Gleason (@TheRealJGleason) is our guest and she’s got a drinking game - sorry, an eating game - for anyone who loves to pick apart Bradley Whitford’s acting technique. Needless to say, Josh is on board. It’s a probable impossibility that by the end of this episode we’ll all understand what an improbable possibility is, and why Sam is so down on it. As the characters anxiously await election results and Donna tries to swap votes with Christian Slater, Josh and Hrishi interview Clark Gregg (@ClarkGregg) about how everybody wants to call him Agent Something. And, Josh looks back fondly on the mighty superpowers that allowed him to summon rain from a clear sky. Our discussion of Season 4 begins! We’re joined by John Gallagher, Jr., who made his Sorkin debut in the premiere, years before he would go on to star in The Newsroom. Here we go, cuties! Before we dive into Season 4, we're answering some pressing listener questions like: why hasn't Martin Sheen been on the podcast yet? Plus questions about music, musicals, and underwear. (Don't be scared.) And to go along with our new Bartlet's Army challenge coin, we present an episode of 99% Invisible that explains what challenge coins are, where they come from, and what to do with them. To discuss the Season 3 finale, we traveled to San Francisco to record a live episode at the Castro Theatre. We'd announced the show would be with a special guest: Aaron Sorkin. But what we didn't tell anyone was that we'd also be joined by a couple of surprise guests: Allison Janney (@AllisonBJanney) and Melissa Fitzgerald (@MaffyFitz). You can hear the audience go crazy when they come out; you wouldn't believe how thunderously loud it was in the actual theater. This one was so much fun to record. Thanks to our guests for joining us, thanks to Sketchfest for hosting us, and thanks to you for continuing to watch the West Wing along with us. Okay, what's next? Josh and Hrishi discuss a few conflicts central to this episode and its making: Amy vs Josh, President Bartlet vs moral absolutes, and script deadlines vs directing schedules. For more, visit thewestwingweekly.com/321. We’re joined by Mark Harmon to discuss all things Simon Donovan. Our interview with him spans the rest of Season 3, so if you're watching The West Wing for the first time, be warned that spoilers abound during that part of this episode. For more, visit thewestwingweekly.com/320. A correction: Eli Attie's teacher, Mrs Morello, is alive. A reminder: Paxton Whitehead, who played Bernard, is also alive. Josh and Hrishi discuss Russians being played by non-Russians, Tom Lehrer, and the Sorkinism of having nothing to do. Plus, to accompany the story of the letter that gets sent to the President, we're thrilled to present one of our favorite episodes of 99% Invisible, “Ten Letters to the President.” It’s a perfect companion for this episode of The West Wing. Big thanks to Roman Mars (@romanmars) and the folks at Slate’s Working podcast for letting us share it with you. This week we're joined by Chris Lu (@ChrisLu44), who served as the White House Cabinet Secretary during the first term of the Obama administration and the Deputy Secretary of Labor during the second term. He gives us some real-world insight into Presidential Proclamations. Plus, we use the special West Wing Weekly Hotline to call Eli Attie (@EliAttie) to get the inside scoop on the writing of this episode. We’re joined by two of the co-founders of the website Television Without Pity, Tara Ariano (@TaraAriano) and Sarah D. Bunting (@TomatoNation), to discuss the lemonlyman.com plotline—inspired by Aaron Sorkin’s own posts on TWoP. We’re also joined by David Wade (@davideckelswade) who was national spokesman for then-Senator John Kerry’s presidential campaign and who later served as Secretary Kerry’s chief of staff. We compare President Bartlet’s hot mic moment in this episode with a famous one from John Kerry when he was a candidate. In light of Donna's brief time as a Canadian in “Dead Irish Writers,” we’re honored to be joined this week by Canadian Prime Minister Justin Trudeau (@JustinTrudeau). (We know. We can't believe it either.) The PM discusses political idealism – both on- and off-screen – and gives us his thoughts on what The West Wing got right, his father's tenure as Prime Minister, how he feels about President Bartlet, and more. Plus, Josh and Hrishi talk about the parallels between the Israeli-Palestinian conflict and The Troubles, and the value of overcoming your fear of public failure. This week, our discussion ranges from chess and poker games, to code switching, to West Wing Weekly themed fart machines. All this, plus Josh, the master prankster, ranks the pranks in CJ and Charlie’s prank war. For more, visit thewestwingwekly.com/314. To get some real-world insight into the Sam/Ainsley/Celia scene in Night Five, we invited three West Wing Weekly listeners – Amy Carlson, Jamie Lynn Crofts, and Debora Verdier, employment attorneys in three different states, representing both plaintiffs and defendants – to give us their perspective in a panel discussion. It's our episode, it's about to become your episode, and we sleep…ehh, ok, not that well. President Bartlet and his father; CJ and her father; Bob Engler and his father…this episode is the Dada of Dada issues. And Josh and Hrishi talk to Blanche Sindelar, the property master for all seven seasons of The West Wing — the keeper of Gail’s fishbowl. To accompany our discussion of "Bartlet for America," we're thrilled to present an interview with John Spencer, who won an Emmy for his performance. We talk to David Daniel (@CNNLADavid), who is a senior producer at CNN Newsource. He interviewed John Spencer in 2002, just before the Emmy awards, about The West Wing pilot, "Bartlet for America," addiction, and more. We're so lucky to have gotten David's original raw tape from that day, which we used to put this segment together. For more, visit thewestwingweekly.com/309. This week's episode gets a bit dark, as does our discussion of it. We're honored to have three amazing guests. We learn more about the realities of trafficking with former UN Ambassador Sarah Mendelson (@SarahMendelson) as well as with Tim Ballard (@TimBBallard), the founder and CEO of Operation Underground Railroad (@OURRescue). And the brilliant but elusive Allison Janney (@AllisonBJanney) finally — finally! — makes her West Wing Weekly debut. For more, visit thewestwingweekly.com/308. Thanksgiving! Native Americans! Turkey! Foodborne illness! Hrishi's dad! All this, plus we present the recording of our live interview with Emmy-winning West Wing composer Snuffy Walden (@snuffywalden). For more, visit thewestwingweekly.com/307. Our discussion of this episode takes many a twist and turn: from the NEA to JFK, from Star Trek to Eddie Murphy. Plus, Toby's confession that he is no fan of musicals leads us to the next chapter of "Hrishi Hruins a Musical." For more, visit thewestwingweekly.com/306. David Pressman is the former US Ambassador to the United Nations and was the first-ever Director for War Crimes and Atrocities on the National Security Council at the White House, and we're thrilled to have him on the podcast to discuss the "War Crimes" episode with us. Plus, Josh and Hrishi get into it over Toby's "we're a team" speech. For more, visit thewestwingweekly.com/305. We’re joined again by our friend Eli Attie, the former speechwriter to Al Gore who went on to join The West Wing in Season 3. Eli has a ‘story by’ credit on “Ways and Means”, and we dig into what that really means. Plus, we talk about the importance and danger that stage directions can provide actors and politicians. Take a listen, you won’t be . . . DISAPPOINTED!!!! Josh and Hrishi are joined by Connie Britton (@conniebritton) to discuss the second half of the Season 3 premiere. I made a joke about Freudian slips in the show notes for Part I (“Josh and Hrishi try to sort their way through it all without making any Freudian slips while talking to each mother”), but it really should have gone here, in Part II. Sorry about that. My dad. I mean, my bad. This is a controversial episode of The West Wing, and one that falls outside the regular storyline of the show. We hash out our conflicting opinions on it to find some common ground. We're also joined by Ajay Naidu to discuss his role as Rakim Ali. And we talk to former White House Press Secretary Mike McCurry, who is now a Professor of Theology; in the spirit of this episode, it's a Jew, an atheist, and a Methodist having a conversation about religion, politics, and pluralism. Aaron Sorkin joins Josh and Hrishi for our final episode of Season Two, to talk about his experience writing "Two Cathedrals." Plus, Kirsten Nelson (@NelsonKirsten) tells us about playing the role of the young Mrs Landingham. We present the first of two episodes of our podcast discussing the Season Two finale. In this episode, we're joined by West Wing writer / producer Lawrence O'Donnell (@Lawrence), aka Jed's father, Headmaster Bartlet. Plus, Mary Graham, author of Presidents' Secrets: The Use and Abuse of Hidden Power tells us all about how presidents have hidden the truth about their health from the American people. And, introducing the BARTLET SECRETARY NAME GENERATOR. Marlee Matlin (@MarleeMatlin) joins Josh and Hrishi to discuss her role as Joey Lucas. Along with her interpreter, Jack Jason (@655Jack), she pranked us pretty badly just before we recorded her interview. Listen for the brutal details of that, plus our discussion of satellites, Sam’s "fair share" of taxes, and our favorite cute will-they-or-won’t-they couple, Ed & Larry. Before we get into Oliver Babish and the Big Hammer, and Donna Moss and the Secret Pumpkin, we start with a much needed follow-up to our discussion of autism in 2.17: The Stackhouse Filibuster. Special thanks to Amy and Jill, who were two of the many listeners who sent us messages with concerns about how autism was addressed. We've got 7 people for "17 People." Richard Schiff (@Richard_Schiff) talks to us about Toby's journey, and the origins of the Spalding ball. Emily Procter (@emilyprocter) talks to us about Ainsley "spilling coffee" with Sam. Rebecca Walker (@rebeccawalker), one of the actual ERA panelists set to debate Ainsley at Smith, responds to her arguments, along with the President of the ERA Coalition, Jessica Neuwirth. And we get a little insight into a fantastic website dedicated to this episode, seventeenpeople.com, from its creator, Jon White (@jonwhitebriefly). Josh and Hrishi are joined by Bradley Whitford (@WhitfordBradley) for the first-ever live taping of a West Wing Weekly episode, recorded at the Marines' Memorial Theatre in San Francisco at the SF Sketchfest Comedy Festival. We also hear from Dee Perkins and Marc Bernardin, parents of autistic children, about the impact "The Stackhouse Filibuster" had on them. Check out photos from the taping at thewestwingweekly.com/episodes/217. In this episode, we look at the uncomfortable contiguity of Bartlet the President and Bartlet the Dad. Along the way, we discuss zeugma, gloriosky!, Smoot-Hawley, and other ridiculous sounding words. We also talk to Nina Siemaszko (@MsSiemaszko) about her role as Ellie Bartlet. Stockard Channing was nominated for an Emmy based on her performance in this episode. Though her performance in the first part of this two-part arc was also excellent, we discuss why this second episode may have had the edge. Plus, a discussion around the language used to identify different groups of Americans. Donate to Mazon in honor of Josh's birthday today. In this episode, we're joined by Don Baer, who was the chief speechwriter for President Bill Clinton, to tell us what it's really like to write a State of the Union Address. And when you're done listening and you're ready to go home, we only have one question for you: How's Grampy? For the last episode of the year, we answer listener questions in our 2nd edition of The West Wing Weekly Big Block of Cheese Day. Thanks so much for listening to the show this year and giving us a great 2016 — apart from, well, everything else that happened. When we spoke to Emily Procter (episode 2.04), she told us a story about a lunch meeting she had with Tommy Schlamme that had an unexpected twist. We've been holding on to her story until this episode. You'll hear why. Plus, a lot of #TrumpAiYiYi. Epic flentl; you don't want to miss this. At this extremely historic moment, we present a very unique episode. (Wow, that really is some terrible writing.) In this episode, we bone up on our Mars with help from NASA Systems Engineer Mallory Lefland, who is working on the Mars 2020 mission at the Jet Propulsion Laboratory. Freddie Mercury said it right. The pressure is on as we discuss one of Hrishi's all-time favorite episodes. Will his feelings be spared by Josh, or will they be placed on the chopping block and pulled apart like a turkey's giblets and flentls?! Introducing the TWWW University Sweatshirt! You can get one for yourself or for your favorite West Wing Weekly listener at thewestwingweekly.com/sweatshirt. For "The Portland Trip," we try to slip the surly bonds of Earth. We are, in turns, lifted and dragged down by our feelings. In honor of Josh Lyman's conversation with Congressman Matt Skinner, we ask real-life former Wisconsin congressman Steve Gunderson what it was like to be the first openly gay Republican in Congress. And we're joined later by Pennsylvania Congressman Brendan Boyle (@RepBrendanBoyle), as well as the Secretary of the Army, Eric Fanning (@SecArmy) — the first openly gay person to head any service in the U.S. Military. How ya doin, Dalai Lama? In this episode, we're joined by steadicam operator Dave Chameides to talk about the complex choreography of the shooting a walk and talk. Plus, we get a visit from Kevin T. Porter (@KevinTPorter) to talk about his Sorkinisms supercut videos. Ginger, get the popcorn, because we're joined by Emily Procter (@emilyprocter) to talk about her first appearance on the West Wing as Ainsley Hayes. Plus, for some context and perspective on the storyline about AIDS in Sub-Saharan Africa, we speak to Ambassador-at-Large Deborah L. Birx, the US Global Coordinator to Combat HIV/AIDS (@PEPFAR). And introducing The West Wing Weekly t-shirt! In Part II of our double header, Bradley Whitford (@WhitfordBradley) makes his West Wing Weekly debut to talk about getting the role of Josh Lyman, and starting the season by getting shot. But first, we speak with Michael O'Neill , who played Special Agent Ron Butterfield. Plus, a few thoughts on Emily's List from its former executive director, Amy Dacey (@AmyKDacey). In Part I, we're joined by director and executive producer Thomas Schlamme , who created the visual language of The West Wing around Aaron Sorkin's words. We ask him about his directorial decisions for the show, and for this cinematic premiere. And we ask: what happened with Mandy? West Wing creator Aaron Sorkin joins Josh and Hrishi for a special episode. Aaron reflects on the experience of making the first season of the West Wing while making the second season of Sports Night at the same time. We look back on the previous season, and look ahead to the upcoming one. Josh and Hrishi are joined by Bill O'Brien to talk about his role as Kenny Thurman. This West Wing episode focuses on polling, so here's a poll question: do you approve or disapprove of the lack of Oxford comma in the title? Kathleen "Bird" York (@birdyork) talks to us about playing Congresswoman Andrea Wyatt, and Mayor Karen Freeman-Wilson (@karenaboutgary), former CEO of The National Association of Drug Court Professionals and current mayor of Gary, Indiana, talks to us about mandatory minimums. This episode of the West Wing represents the lowest point so far for the Bartlet team, but perhaps the highest point so far for the series. Josh and Hrishi are joined by The Honorable Patrick Murphy (@USAMurphy), Under Secretary of the Army. While he was a Congressman from Pennsylvania, Secretary Murphy helped overturn Don't Ask, Don't Tell. Like Toby in this episode, Josh and Hrishi go to shul to try and learn more about the death penalty and faith. They have a conversation with Rabbi Jonathan Spira-Savett. Plus, we email Aaron Sorkin to ask how Marlee Matlin came to be cast as Joey Lucas. This episode of the West Wing deals with hate crimes, and our discussion comes close on the heels of the massacre in Orlando. So, we asked Senator Bob Casey (@SenBobCasey) about the current state of hate crime legislation. We also talk to Liza Weil (@liza_weil) about her role as Karen Larson, as well as the Executive Director of the Matthew Shepard Foundation (matthewshepard.org). The path to a Supreme Court nomination takes us through a discussion of the right to privacy. Plus, Ronald Klain (@RonaldKlain) tells us about the real-life short list that he put together for President Clinton that led to the appointment of Justice Ruth Bader Ginsburg. Josh and Hrishi largely disagree with each other about this episode. Plus, award-winning costume designer Lyn Paolo (@lynpaolo) discusses her work on the series and on this episode in particular, which earned her an Emmy nomination. Janel Moloney (@nellymoloney) joins Josh and Hrishi to talk about playing Donna, and Ben Casselman (@bencasselman) gives an update on the state of the census. For Big Block of Cheese Day, Josh and Hrishi are joined by Eli Attie, who was Vice President Al Gore's chief speechwriter before leaving politics and joining The West Wing as a writer and producer. Plus, the truth about David Rosen. Dulé Hill joins Josh and Hrishi to talk about shooting his first episode of The West Wing, visiting the real White House, and losing to Martin Sheen in 1-on-1.